Grooming – an industry that’s constantly witnessing improvements and innovations. Grooming products are a must for any man of the modern world. In order to keep a pleasant appearance, you must purchase a wide array of products that are meant to improve your look and, let’s face it, that doesn’t bother most of us. Grooming can be fun and it will most certainly improve your self esteem and even comfort levels. As previously stated, there are a lot of grooming products that men use on different parts of their bodies. As we progress in age, hair starts popping up all over the place. Nose hairs are particularly annoying, as they attract more dust and have a big negative impact on your appearance and confidence. It’s important that you use proper tools to get rid of them, to avoid injuries or dryness, which can really mess with your comfort. Using sharp, small scissors or clippers can really damage your tissue, resulting in bleeding and even infections. Luckily for us, nose hair trimmers have been designed in such manner that you won’t be cutting too deep, avoiding stupid grooming-related injuries while achieving optimal results. Throughout this product round up, we’re going to take a closer look at the best nose hair trimmers on the market. We’ll briefly explain each product’s features and offer our biased opinion regarding their value and utility. A classic take on the nose hair cutter design, the Panasonic ER-GN30-K is featured on our list due to its inexpensive price tag and the utility it brings with its design. 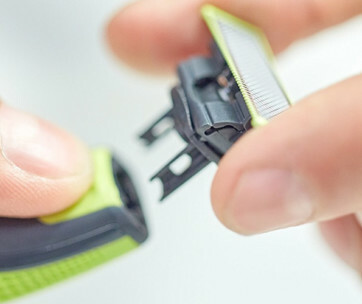 Powered by a AA battery, this trimmer isn’t environmentally-friendly, as it’s non-rechargeable, but on the plus side, you can use it anywhere without bringing a charger and get up to 90 minutes of trimming on just one charge (around 30-40 uses). Actually, this is a hair detail trimmer, so you can use it in your nose, on your ear hair, beard, eyebrows and mustache to get a more refined look. 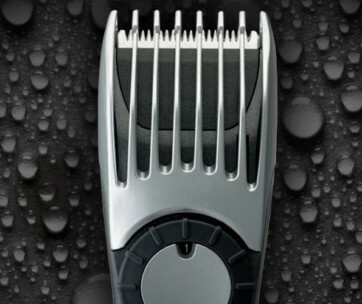 It has dual-edge curved, hypoallergenic blades, that allow you to reach every corner, nook and cranny, so that you get a full grooming experience. The blades are also made using stainless steel, so getting them wet won’t be an issue. The rotating blades will draw in wetness, so that hairs won’t stick to the tissue, allowing you to cut each and every one of them in a manner of seconds. Because of its design, the blades won’t go skin-deep when trimming, so that you will have plenty length left for natural nose filtering. It’s watertight, so you can use it on the go, in the bathroom sink and even while in the shower, which is very convenient. It comes with a protective nose trimmer cap, to keep it neat and clean when it’s not being used, and a brush, to clean it (ideally) after every use. If you decide to go with the Panasonic ER-GN30-K Nose Ear & Hair Trimmer, make sure that, while cleaning different parts of your face, you don’t apply too much pressure, as the blades are spring-controlled and, if the spring gets damaged, it won’t operate at full capacity. While manufacturers such as Gillette and Panasonic are well-known in the industry, the next product we’re going to discuss is a ToiletTree waterproof hair trimmer. This doesn’t mean that it doesn’t measure up to the quality of other brand products on the market, quite the opposite. First off, we need to mention that this comes with a lifetime replacement guarantee and from a company with great customer support services. At a first glance, the steel-covered body gives it a nice, polished, premium feel. The blade system, placed on the top, is complemented by a white LED light that allows you to detect and remove any unwanted, lingering hairs. The blades are built in such a way that it cuts hairs both vertically and horizontally, and it’s got a curved shape, so you’ll be reaching every corner due to their easy nose hair removal design. It still uses AA batteries, which is either a plus or a minus, depending on how you look at it. The stainless steel blade system is easy to clean – just rinse it with water and you’re good to go. In addition to using it for your nose hair and ear hair, it’s perfect for any kind of adjustments, so feel free to shape your beard and eyebrows. Another great thing about the stainless steel and plastic combination is that you can use it both in dry and wet environments, making it a great nose shaver. As previously stated, the lifetime replacement guarantee will cover any faulty products and the customer care service is, reportedly, very, very responsive. Very affordable and designed using quality materials, the ToiletTree Products Professional Water Resistant Heavy Duty Steel Nose Trimmer is sure to make any man happy and this is the reason it found its place on our best nose hair trimmers list. Philips is a well-known name in the grooming industry (among other industries), so it’s no surprise that they’ve made our best nose hair trimmers list. The Norelco Nose trimmer 3000 is a great choice for someone who’s looking for a bit more bang for their buck, as it comes with different heads and accessories that will bring more quality to your grooming routine. For starters, it’s similar to the previously featured products, as it still uses a AA battery for power (Lithium for maximum power). This waterproof hair trimmer comes with two interchangeable heads, one for nose trimming and the other is equipped with eyebrow guards, which will make it easy for you to achieve equal results for both of your eyebrows in the least amount of time. The second one is actually a skin precision trimmer, so you can use it as the others, to adjust the shape of your beard, mustache and eyebrows. Moving back to the nose shaver element of the Philips Norelco Nose Trimmer 3000, the blades are designed in such a way that they won’t be pulling hairs, avoiding annoying leaky eyes and pinching sensations. Because the body is watertight, you can easily clean it under the sink or in the shower, right after using it. Philips included a battery in their package – finally, someone who’s actually being considerate. That being said, don’t pick this over other products if you’re not going to use the different accessories, as the full plastic build and inferior really drop the value, as it’s in the same price range as our previous features. Let’s take a look at a more exciting product. The people at Hecare have managed to manufacture a very well-built nose and facial hair trimmer that also comes at a reasonable price. Although the price tag is a bit higher than what we’ve seen so far, you can tell this little guy is different just by looking at it. First off, it comes with a support for the trimmer and its two heads, which will fit nicely on your bathroom shelf. The bundle also includes two additional interchangeable heads, one for shaving eyebrows and the other for shaving and adjusting your beard. The Hecare Star 3 In 1 trimmer has a stainless steel body, giving it a nice, premium look and extra durability. The AA battery that powers it will give it enough power to trim your nose hairs without pulling and pinching. 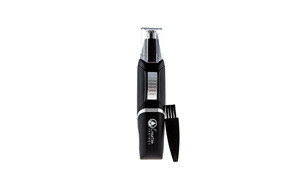 The trimmer also has an LED light that will assist you in tracking down rogue hairs. All of the heads are washable and usable under the shower on in the dry with no issues at all. In addition to the great design, we think that the added utility and higher quality build makes this trimmer stand out so far, as the value it brings is, undoubtedly, much higher. If you aren’t sold yet, the manufacturers offer a one-year warranty, which should banish any doubts regarding the quality of the Hecare Nose trimmer. This is a perfect grooming gift for your loved ones. Braun is a company that manufactures only men’s grooming products, so the quality of their products is backed by their experience in the industry. The Braun Ear and Nose Hair Trimmer is meant for men that know exactly what they want – simple and effective trimmer without any additional accessories. Another non rechargeable nose hair trimmer, the Braun trimmer is also powered by AA batteries, and the manufacturers have been kind enough to include a Duracell AA battery in the package which will give you up to 120 minutes of uninterrupted trimming. The sturdy plastic will make it hard for you to damage it. The only thing that’s missing is a brush, which is kind of annoying, as a brush is ideal for cleaning tiny hairs that constantly get stuck in the blades. Other than that, it falls into the standard nasal hair trimmers category – stainless steel blades, designed to be curved to reach every part of your nose, watertight build so that you can use it in the shower and a very compact design that makes it easy to fit in your suitcase or backpack in case you plan on travelling. While this device will remove nose hair with no problem, the fact that it’s in a similar price ranged with our previously-featured nose hair trimmers make it a bit unappealing, since it lacks extra features. Sometimes, while searching for the right product, we stumble on a device that has it all (well, almost). 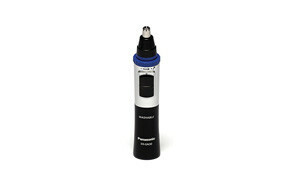 This is the case with the Creation Springs Electra-Trim nose and ear hair trimmer. Creation Springs manufacture various bathroom products, such as tweezers, tooth brushers, and trimmers, so they know a thing or two about design and features. Moving on to the actual trimmer, this little guy packs quite a bit of value and it’s currently the cheapest product on the list. The multipurpose head, which comes with curved, stainless steel blades, allows users to easily manipulate the nose hair cutter and reach even the toughest angles. If you think that, by chance, you didn’t cut all of the longer hairs in your nasal cavity, then you’ll be glad to know that the Creation Springs trimmer comes with a powerful LED light, making it easy to hit every spot. Additionally, to make things even easier, the Electra-trim nose and ear hair trimmer has a three-vent vacuuming system, which will remove any cut hairs that are obstructing your vision. The multipurpose head is also useful for adjusting facial hair, although there are better trimmers for that. Powered by a double A battery, you’ll have plenty of power to work with for months to come. The full design that includes a multi purpose head, LED light and vacuuming system makes for an easy nose hair removal experience at a very low price – very impressive. The Wahl 5545-400 Ear, Nose and Brow Trimmer is a handsome grooming tool that allows you to eliminate pesky nasal hair without having to get in there and rend each hair individually by the root. It features an ergonomically designed body that’s easy to grip and hygienic rotating blades that draw the offending hairs in and cut them back without any of the nasty pull and tear you’ll experience from some lesser nose hair trimmers. For those new to mechanical trimmers this is as good a starting point as you’re likely to get since it’s easy to use, safe, painless and affordable. The 5545-400 has a helpful light that illuminates the inside of your nose so you can see what you’re doing and what is left to do. Some find the light annoying but if you angle it a bit away from your eyes it’s actually quite helpful. The trimmer head itself is easy to remove and clean, which is something that can be done either with a can of compressed air or by running it under the faucet. It’s not the quietest nose trimmer on the market today, nor is it the noisiest. For the most part noise levels are not unlike what you’ll experience with an average electric shaver. While many of the attachments such as the eyebrow trimmer seem like little more than afterthoughts the primary function of this tool is to help clear the undergrowth from your nose and, to a lesser extent, your ear hair. And it does a bang-up job of that. If you need a good trimmer for your manly parts, check out our guide to the best pubic hair trimmers. If you’ve had bad experiences with previously-owned nose hair trimmers, the SUPRENT Nose & Ear Hair Trimmer is probably one of the best nose hair trimmers for you. The reason we’ve said that is the fact that it is equipped with a very powerful motor. The 6500 RPM mute motor compliments the blades and offers one of the best trimming experiences on the market. The noise won’t hit 50 DB, which is very impressive and will provide a very discreet nose and ear hair removal, in case you’re on the go. While the body is made out of fairly-basic plastic, it still provides a lot of toughness for a device this small. Stainless steel blades are standard, so this trimmer comes equipped with the same quality blades we’ve seen so far. The LED light will allow you to adjust your movements so that you won’t be cutting too deep, as the light becomes more intense if you put more pressure on the tissue. This particular device comes with a travel bag – a very nice touch. Why not save some money if you’re the type that moves around a lot? Use it in the shower or in the office bathroom, it’s waterproof and easy to clean – you won’t be leaving any mess behind. Additionally, the package includes a second head, meant for adjusting eyebrows, beards, sideburns, mustaches. Users are very pleased with this product as it’s one of the most purchased trimmers on the list. Panasonic have brought their A-game when crafting this product. The ER430K ear and nose trimmer is a more premium option, for guys that don’t pull any stops when it comes to grooming. Reasonably priced and feature-packed, this featured product is one the best nose hair trimmers the market has to offer. What’s most surprising is that this product falls under the same price range as what we’ve featured so far, but it offers a bit more bang for your buck. The blades – they’re arced, made out of stainless-steel, hypoallergenic and sharp, making it easy to remove nose hair comfortably and safely, avoiding nosebleeds and wet eyes. It’s wet/dry, so the shower is an ideal place for carrying out grooming activities using this bad boy. Well, that’s not true, because this is actually designed to vacuum all of your trimmed hairs, keeping it neat, clean and simple. The hairs are then stored into a “chamber”, which you can easily remove and empty. Powered by AA batteries, or rather battery (ideally Polaroid), the motor gets enough juice for a very smooth and safe experience. For spot-on grooming, Panasonic has included a cleaning brush and a travel bag, so you’re ready to trim on the road. Honestly – great product, great value – one of the best nasal hair trimmers out there. Okay, we’re about to wrap our best nose hairtrimmers list, but we need to feature one last product. By now, we assume you’re tired of AA-battery powered trimmers, so you’ll probably be pleasantly surprised to find out that this is a rechargeable nose hair trimmer. The battery can be charged in three hours and a single charge lasts for months. If you have strong feelings regarding the environment, this would be the most friendly pick on the list. That being said, the Sportsman 3 in 1 isn’t even waterproof. That’s disappointing, to say the least. The only waterproof part is the head, which you can remove and clean, to prevent bacteria from growing. The 360 rotary cutting system is pretty standard, but it works damn fine with the 6500 RPM motor. Additionally, you’ll be getting two interchangeable heads, great for trimming and adjusting your beard, eyebrows, mustache and so on. Honestly, this is a little weird, because, compared to the other devices, this one has a rechargeable battery, but it isn’t waterproof, so I guess it kind of evens out. Because for most of you nose hair trimming is probably a new thing that you have to put up with, after listing the best nose hair trimmers out there, we’ve decided to provide a buying guide and some instructions about how you should proceed. While you might think it’s all intuitive, try to go through it as we’ll be revealing some neat tips and tricks. For starters, let’s focus on what you should know before making an informed purchase. The fact that there are so many similar products on the market is very confusing, so quality will be the main factor that separates them. Blade System – When shopping for a nose hair trimmer, make sure you pick something that’s got a good blade system – usually, manufacturers will mention “double-edged” on the packaging. Double-edged blades are really great for trimming hairs without pulling, so in order to avoid pain and discomfort, go for one of those. LED’s – Secondly, LED lights are very useful in avoiding harming yourself. While you put more pressure on your tissue, the LED light will intensify, so you’ll know when you’re overdoing it and might damage your skin. That’s also useful for noticing hairs that you’ve overlooked. Vacuum System – An integrated vacuuming system can also be very useful at cleaning your nostrils, so that you don’t get any of the discomfort associated with left-over hairs. Additionally, the vacuuming system will also help you keep a clean and tidy bathroom, which you’ll appreciate. Batteries – Either go for rechargeable or batteries – this one’s up to you. Batteries have the advantage of being widely-available, so you won’t be having any issues if you run out of power while you’re on a trip. USB charging requires an active USB port, and you might not have that on-hand when going for a light trip. Accessories – Additional accessories are also nice. If you’re going to travel a lot, some companies bundle a traveling case to fit the trimmer and its accessories. 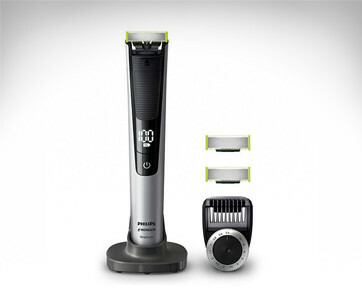 If you don’t really enjoy going to beauty salons and plan or growing a beard, getting a trimmer that comes with additional interchangeable heads will be very useful. After you use your scissors or trimmer to cut down excess hair, you can use a detailed hair trimmer accessory to give a nice shape to your beard, shave your sideburns and trim down your bushy brows. Nose trimmers are also great for shaving ear hairs. Waterproof – Lastly, waterproof. Arguably the most important feature to have in a nose hair trimmer. Try to focus on models that allow you to trim in the shower, as it’s cleaner and won’t have to lift a finger. In addition to that, you know that all of the parts are tightly fit, so the body of the trimmer is a bit tougher. The blades can be easily-cleaned under a running tap, so bacteria won’t accumulate in the tip, which could’ve lead to an infection. Price – Price isn’t really an issue, as most of them are surprisingly tight when it comes to that. Just make sure you pick one that has all or most of the above-mentioned features in order to have the best grooming experience. Q: How to use a nose hair trimmer? A: Ever since man first established settlements and started caring about how he looked the issue of nose hair has loomed over the grooming landscape. Unfortunately, if we live long enough we’ll all come face to face with nasal undergrowth at some time. Some of us will notice it ourselves while others will be made aware of the issue when that special someone recoils in horror after approaching for a kiss. But however awareness is presented to you you’ll need to deal with it, and there are three more or less accepted methods of doing so: nose hair scissors, manual trimmers or mechanical trimmers. (There is a fourth way - plucking - but as a society and as individuals we should be well beyond the stage of pulling hairs out of our nose by the root, regardless of whether we’re using our fingers or a lovely pair of tweezers.) Below are step by step guides to each of the three best techniques. Flush out your nose as best you can first to remove any mucus and loose debris that might interfere with the process. Let your nasal passages dry thoroughly. This should only take a few minutes. Position yourself in front of the bathroom mirror with plenty of light on your nose. It doesn’t really matter if you’re standing or sitting as long as you are comfortable and still. Carefully insert the scissors into your nose and start clipping away the growth as you go. Work your way in slowly, pulling the scissors out from time to time to assess progress. Once you are sure all the hairs near the opening of the nostril have been trimmed back move to the other nostril and repeat. Don’t try and trim too far in as you could wind up cutting the sensitive tissue deep inside the nose and cause an infection. Again, you’ll want to flush out your nostrils to remove any lingering mucus or other debris and to fluff up the hairs as much as possible to make them agreeable to being cut. Use a bit of warm water and if, you have some, a mild soap. Dip a washcloth in the solution and have at it. Let your nostrils dry out thoroughly before introducing the manual trimmer to the nostril as this will give you the best chance of getting a clean effective cut. Slowly insert the business end of the manual trimmer into your nostril until the blade portion is fully inside. Just make sure to insert it slowly and to stop if you meet resistance. Now turn the trimmer gently back and forth to allow the cutting head to snag and cut the hairs. You should be able to get a fairly thorough cut with this type of trimmer. But beware, they do have a tendency to pull hairs out by the roots if you turn too aggressively. Also, don’t expect to get the same type of clean, comprehensive cut you’ll get with a mechanical nose hair trimmer. Still, in many cases just a few seconds of relatively gently back and forth motion should get rid of much of the excess hair. Once again, take some warm water and mild soap, moisten a clean washcloth with it and gently scour your nostrils to remove and debris and/or mucus that might be in there and that could interfere with the cutting process. It doesn’t take much to sully up the works so make sure you get each nostril nice and clean. Once the nostrils are completely dry gently insert the nose hair trimmer just inside the rim of the nostril and switch it on. 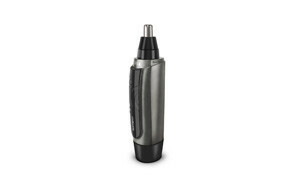 Unlike the manual nose hair trimmer you don’t want to start with the mechanical trimmer completely inserted. You’re going to start at the opening and gradually work your way inside, trimming as you go. It shouldn’t take more than 10 or 15 seconds to do its job, at which time gently remove the trimmer from your nostril and turn it off. Check to see if it’s collected and mucus or other debris before inserting it into the other nostril. If it has then place the cutting tip under the tap for a few seconds and clean it off. Let it dry for a minute or two before inserting it into the other nostril. Mechanical nose hair trimmers take much of the pain and guesswork out of the process of trimming your nasal hair. They’re faster than scissors and less painful and more thorough than manual nose hair trimmers. Q: How often do you trim nose hair? A: On average hair grows at anywhere from five to six inches per year. That’s true whether the hair is on top of your head or inside you nasal cavity. At that rate the average guy will need to insert the nose hair trimmer about every two weeks. To be sure factors such as race, diet and even the amount of water you drink can have an impact on the speed of hair growth. But on average most guys are going to want to go in for a trim every two weeks or so. There’s no law that says you can’t do it every week. But unless the hair is long enough for the trimmer to get a hold of it’s not going to be very effective. So mark it down for every two weeks to start and see how that works. Q: Are nose hair trimmers painful? A: As we mentioned above manual nose hair trimmers can often be painful as they have a nasty tendency to grab hairs and rip them out by the root instead of trimming them. And anyone who has ever tweezed their nose hair can testify what an unpleasant experience that is. Electric nose trimmers though are typically pretty painless devices, especially so after you’ve used them a few times and gotten the hang of the whole thing. Here are a few general tips to making the process of trimming nasal hair as painless as possible regardless of whether you use scissors or the best nose hair trimmer on the market. Bring plenty of light to bear - It’s really important that you be able to see what you’re doing whether you’re using scissors or a manual or electric trimmer. Adequate light will allow you to assess the situation prior to trimming and to tell when enough hair has been removed that you can confidently stop. If you’re sticking sharp nose hair scissors into your nostril without being able to see what you’re doing you’re unnecessarily flirting with cuts and infection. And you don’t want a nasal/sinus infection. Always use a mirror - Being able to see inside your nostrils to safely remove hair requires both light and a mirror. Ideally you’d be doing the trimming at home in the privacy of your own bathroom with plenty of time so that you’re not rushed. Set up comfortably in front of the bathroom mirror (whether that means standing or seated is up to you) and make sure you can see clearly via the mirror into your nostril before you start. If you can’t then adjust your stance or seat, or bring more light to bear if that’s what’s needed. Read any instructions - If you’re using a trimmer, whether manual or electric, make sure you read the instruction manual before starting. The manufacturer may have device specific instructions that will have an influence on the final results or have specific warnings to issue about using their product in a particular way. Keep it clean - While cleaning the nose hair trimmer isn’t as glamorous as walking the red carpet at the Academy Awards it’s nonetheless something that needs to be done after every use. No buts. Few things are as gross as a nose hair trimmer that’s become clogged with snot and hair fragments over time. A clogged trimmer will also do a lousy job of trimming your nose hair and will likely pull and yank at hairs instead of cutting them. Q: Will your nose hairs grow longer after you trim them? A: The science says “no” but the experience says otherwise. While it’s hard to argue with the science of hair growth it certainly seems as though cutting or shaving hair regularly does cause it to grow back both faster and fuller. The fact is however that it doesn’t matter. That’s right, it doesn’t matter if cutting hair causes it to grow back faster or not. You can’t have tree roots extending from your nostrils and expect to have much success in the modern world whether in business or personal affairs. So if hairs extending from your nose have become an issue (as they will with most guys eventually) man up and trim them back whether or not this trimming is going to cause accelerated growth. Not doing so is just gross. Just remember however, that we said “trim” not “pluck”. Plucking nose hairs is not the answer as the hairs in your nose are there for a reason. That reason is to filter dust, dirt and allergens from the air before it enters your lungs. Simply ripping them out exposes your lungs to all manner of pollutants and can make you more susceptible to respiratory illnesses. So stash the tweezers and get a good mechanical nose trimmer. Q: How to maintain and clean a nose hair trimmer? Remove any screws that are holding the blade covering in place. In some cases there will be no screws and the cover may just be snapped on. Remove the blades and wash them in warm soapy water. If your trimmer came with a cleaning brush use it to clean the blades. Then let the blades dry thoroughly. Pour some rubbing alcohol into a bowl and drop the blades into the alcohol. Let is sit for a few minutes then use the cleaning brush again to remove the last vestiges of debris. Rinse the newly cleaned blades in alcohol once more before setting them aside and letting them dry. Reassemble the nose hair trimmer. Q: Will trimming nose hairs make you more susceptible to diseases? A: As we touched on above plucking nose hairs out by the roots is a bad idea because those hairs are there for a reason: to protect your lungs from airborne contaminants. In addition, plucking nose hairs leaves you susceptible to infections and will also impact the quality of the skin on the outside of the nose, above the area inside where you plucked the hairs. Using an electric trimmer, however, should not present any particular health risks if done properly. Grooming is important and it adds health benefits, not just aesthetic ones. That being said, make sure you use proper trimmers to shorten your nose hairs, as you can really damage the tissue and it’s a literal nightmare to live with a dry nose. Make sure you follow our general guidelines for shopping and using nose hair trimmers and you’re going to be fine. All of the products featured in our review section have been well-received by users and offer the perfect amount of value and utility.